Hi Folks! 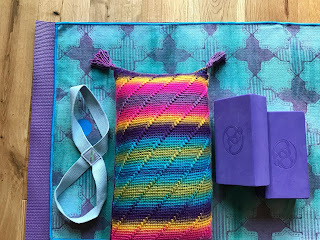 So today I'm sharing how to make the yoga cushion I revealed in the last post. It's a simple stitch pattern that really makes the yarn sing! 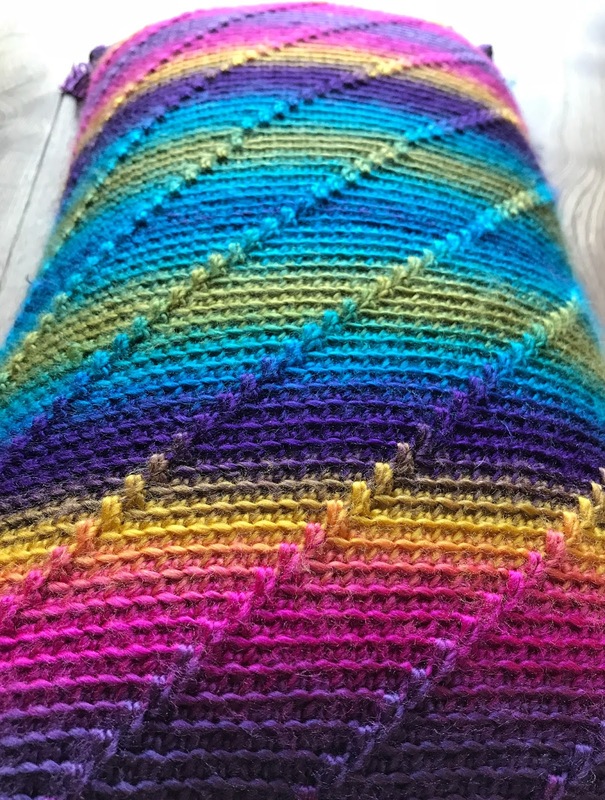 Scheepjes Wanderlust yarn is single spun 100% acrylic yarn with a fairly slow colour change that allows for an effect where the colours merge into each other to give a pleasing striped finish. The width of your project will determine how wide the stripes appear. So the wider your project, the narrower your stripes will be. 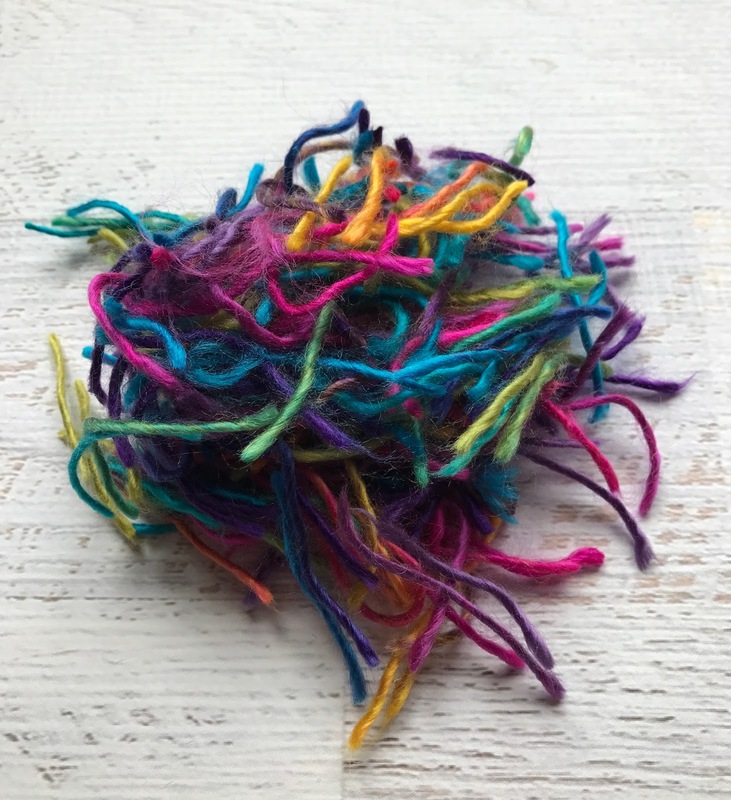 The ball size is 100g and for that you get 232 metres of yarn. 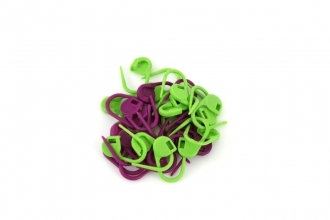 It retails at around £3.99 per ball and is machine washable at 30 degrees. For my Wanderlust journey I opted for the Hawaii colour way.....because I loved the colour palette and it also matched my yoga accessories nicely! 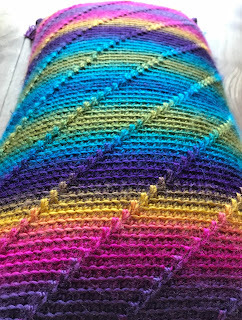 When deciding on a stitch for this cushion I wanted one that not only showed the yarn to it's best but also had some texture. 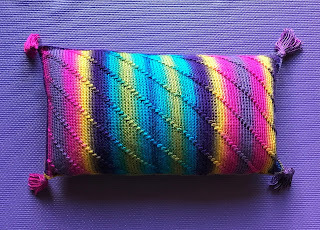 I made a fair few swatches with different stitches before I decided on this one. Wink has produced a fabulous step by step guide to make this stitch so I'm not going to reinvent the wheel by posting another guide here today.....you find her instructions HERE. That link is for the English version. The Dutch version can be found HERE. How To! Make 2 oblongs following the pattern instructions from the links above. You will chain 50 + 1 to give the required width for the cushion. If you are making a different sized cushion you will have to adjust the starting chain to fit. The pattern calls for multiples of 10 plus 1 for turning on the first row only. At the end of each worked row following this you will fasten off, turn your work and rejoin the yarn. Whilst you are working this pattern, the right side of the work will always be visible. You will end up with lots of ends to weave in! If you are like me and find this a tedious chore, I would suggest working around 10 rows and then stop and weave in those pesky ends! Continue until you have worked 84 rows. Fasten off. Now make the other cushion piece exactly the same. As the 2 cushions pieces are being stretched over a cushion pad I didn't block them. ......to evenly pin the remaining sides together. It just makes it a bit easier and ensures that the sides are evenly joined. It can be a bit fiddly! Fasten off and weave in (MORE) ends! 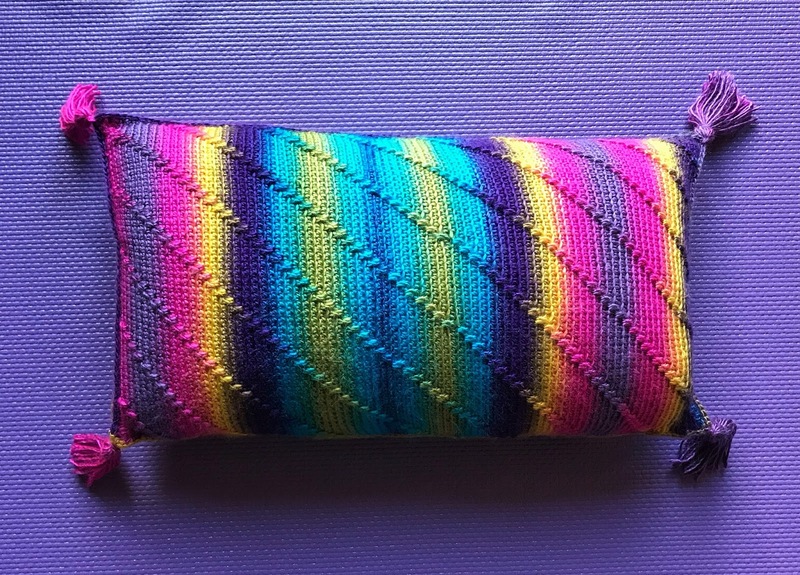 I finished off my cushion with some tassels added to each corner. You can find instructions on tassel making HERE! You now have a finished cushion! Next time I'll show you the yarn I've chosen for my next project and share the inspiration behind the colour choices.